Click here to purchase. Not ready for the full 8 course Fundamentals package? Check out our new Adventure Program for a one time epic experience! Read more about the anatomy and history of a longsword here. Instruction in the basics of Armizare, a medieval Italian combat system designed to train knights for the battlefield and dueling ground. A technical and strategic focus on the longsword, a versatile cut-and-thrust weapon used in both hands. Instruction in the fundamentals of the sidesword and the poleaxe. Following successful completion of the Fundamentals curriculum, students are awarded their Green Cord, the first rank in the Weapons Mastery Program, and have the option of continuing their studies at higher levels. Fencing masks and throat protectors (gorgets) are supplied by Academie Duello any time there will be weapon to body contact. Many Mastery Program students like to purchase and own their own masks, gloves and gorgets; all are available in the Academie Duello Arms and Armour store. A set of comfortable clothes suitable for doing exercise (including indoor running shoes). A simple pair of thin cloth or leather gloves as well as groin protection are optional. As noted, Academie Duello provides all additional equipment necessary for the class, including weapons, fencing masks to protect the face, and collars of leather or metal called gorgets which protect the throat. You may also choose to purchase your own training weapons and necessary protective gear from the Arms and Armour Store if you like. Get a head start in the art of the longsword at home with one of our Online Swordplay Courses. Learn the art of the graceful and powerful rapier, duelling weapon of the Renaissance, along with the sidesword and longsword. This 8-class beginner sword fighting program will teach you the fundamental skills of the traditional European duellist in a fun, engaging, and welcoming environment great for adults of all ages and levels of physical ability. Read more about the anatomy and history of a rapier here. An introduction to the fighting system of Armizare and the duelling systems of the Italian Renaissance. Intensive training on the fundamentals of rapier combat with the goal of developing excellent technique. Instruction in the fundamentals of the Rapier, Sidesword and Spear. Personal training weapons and protective gear is also available at our Arms and Armour store, should you wish to purchase your own. Get a head start in the art of the rapier at home with one of our Online Swordplay Courses. 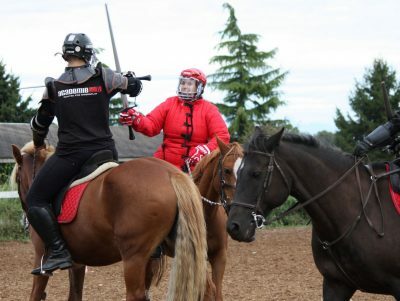 Join us at Cornwall Ridge Farms, our beautiful partner equestrian facility located in Langley, BC, and experience your childhood fantasy of being a knight as you take the first step in Academie Duello’s Mounted Combat Program. Take the Intro to Mounted Combat Workshop to get a taste of the whole program, or dive right in to our Beginners Courses! Ranks in the Mounted Combat Program are obtained by achieving minimum skill levels in riding, horsemanship, and mounted combat skills. Just want to learn to ride, or simply improve your English riding skills? You’re welcome to participate in our Riding and Horsemanship Program without joining in mounted combat or archery activities (though when you see how much fun we have, you may change your mind! ).Private riding lessons are also available – contact us for further information. Not ready for the full 6 course Fundamentals package? Check out our new Adventure Program for a one time epic experience! 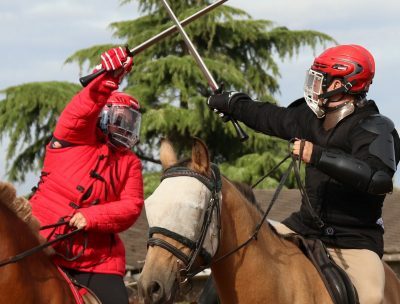 This 6-week series of classes is intended to give you the basics of swordplay from the ground to prepare you for fighting from horseback. Participants at this level will practice from the ground and the false-mount to achieve the combat skills needed to attain the rank of Green Spur. Once you have your Green Spur, you can sign up for Intermediate Mounted Combat courses and participate in Mounted Games events at our Playdays and annual Carosella tournament. In this 6-week course you gain a solid understanding of fundamental horse care and build your riding skills at the walk and trot. Spend time safely and happily around these magnificent and gentle creatures. If you have prior English riding experience, you may request an assessment and join the program at a higher level. In this three hour workshop for beginners you will spend an hour and a half on the ground learning the fundamentals and body mechanics of Hungarian style horse archery. You will then have an opportunity to shoot from both the false-mount (wooden horse) and real horses led by experienced handlers. This workshop is appropriate for beginner archers and riders, experienced archers who would like to learn to shoot from horseback, and experienced riders who would like to add archery to their repertoire of mounted skills. Students will begin with theory and then receive hands-on instruction and coaching at our indoor range. In this 4-class course you will learn the fundamentals of shooting the modern recurve bow. Practical topics will include range safety and etiquette, shooting, and care of the modern takedown recurve bow to build precision and consistency in the archer. This course is ideal for students with little to no experience with archery. If an event is closed, or if it shows no spaces available, email info@academieduello.com or give the front desk a call at 604-568-9907 and we’ll see if we can fit you in! We offer private archery lessons for groups of up to six people For further information about dates and pricing, please contact Academie Duello’s front desk either by e-mail at info@academieduello.com or by phone during business hours at 604-568-9907. 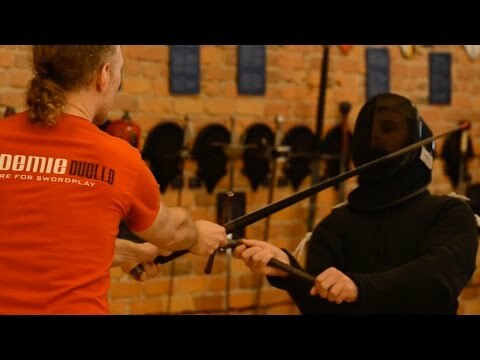 Join us for a program that combines the age old techniques of swordplay using two-handed swords, shields, and staffs, with modern physical conditioning science to create a program that exercises your mind and body. To join the program you need to first establish a base in swordplay skills by attending our Longsword Fundamentals class. No prior experience is required to join into our Kettlebells and Indian Clubs fitness program. An amazing way to build core strength, mobility, and power. To sign up, drop by in person or contact our front desk by emailing info@academieduello.com or call us at 604-568-9907 during business hours. For course times check our schedule here.